I shouldn’t have enjoyed this book, yet I couldn’t put it down. The novel details a butler named Stevens nearing the end of his career. Part of the book revolves around Stevens driving across the countryside in order to reunite with a former fellow servant, Miss Kenton. He’d like to offer her a position … or is there something more he has in mind? These are no mere servants, however. Stevens was once the epitome of perfection as the highest ranking butler in Darlington Hall, a mammoth estate owned by an internationally renowned gentleman. Though those days are past, Stevens reminisces about them as he travels. I agree that the plot is not the most enticing, yet trust me when I tell you that as the story unfolds, Stevens becomes a fascinating character. He is incredibly conscientious, yet emotionally impotent. His loyalty is unfaltering, but he also lacks critical perspective. His work ethic is nearly super human; however, he cannot prioritize between his work and his personal life. And his morality? Dubious, at best. These contrasts create a deeply satisfying character study. Make no mistake, though, it is Ishiguro’s pacing that makes it so captivating. He knows exactly when to introduce revelations. Just as things seem to be stagnating, the author embarks upon a relevant piece of information that calls everything prior into question. Because Stevens takes his role so seriously, he is an incredibly well studied, intelligent man. His vocabulary is complex which results is very high diction throughout the novel. Consequently, Ishiguro creates beautifully structured sentences that demand both concentration and consideration. I’m ashamed to admit this is my first Ishiguro book, so I don’t know if this style is a reflection of Stevens’ personality or the author’s typical delivery. Though I only read the book because a friend recommended it, I’m glad I did. If you appreciate excellent pacing, engaging vocabulary, and a true character study, I believe you will enjoy The Remains Of the Day. 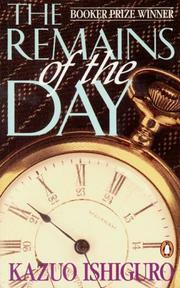 This entry was posted in Book Reviews and tagged arts, Book Review, books, entertainment, kazuo ishiguro, literature, review, the remains of the day.